Lastnewsbd, 3rd July, Dhaka: A portion of a hill next to Rangamati-Chittagong highway collapsed in Deppochhari area around noon, suspending vehicular movement for about an hour on the route. Roads and Highways executive engineer Emdad Hossain told Prothom Alo that the movement of vehicles resumed after steps were taken. It has been raining incessantly in the area since Sunday night. The district administration had alerted the locals, some of whom moved to shelter centres. Rangamati has been hit by landslides again, only 20 days after the death of 110 people in such a natural calamity in the district. 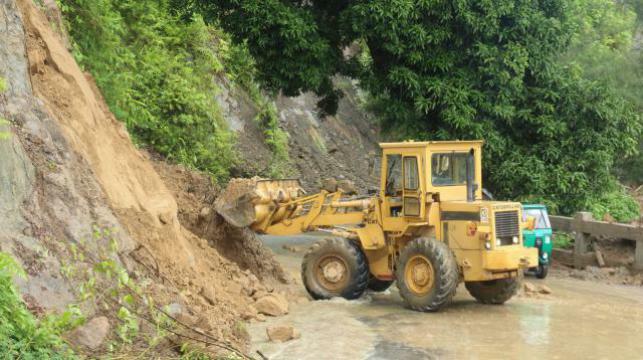 However, no casualties have been reported yet in Monday’s landslide.